BERKEBILE 2+2® POWER STEERING FLUID... is blended with mixed naphthenic/paraffinic base oils and carefully tested additives package to provide good performance in power steering systems. It contains a unique friction modifier that has been shown to reduce power steering pump noise (squeal). BERKEBILE 2+2® POWER STEERING FLUID... will perform satisfactory in power steering units where automatic transmission fluids are specified, and is approved against the Saginaw Gear Division of General Motors GM 9985010 (part #1050017), Ford Motor Company ESW-M2C128-C, Chrysler MS-5931 (part #40226411), American Motors AM 4060 (part #AM 8993342) and Volkswagen TL-VW-570-26 Power Steering Fluid requirements. It also meets the technical requirements of Ford Motor Company ESW-M2C128-D, but does not contain the specified blue dye. - MEETS SPECS FOR ALL U.S. AUTO MANUFACTURERS! - MIXES WITH ALL POWER STEERING FLUIDS! - BLENDED WITH ANTI-FOAMING & ANTI-CORROSIVE ADDITIVES! - REDUCES WEAR; CONDITIONS SEALS; HELPS PREVENT LEAKS; AND QUIETS STEERING SQUEAL! Turn off motor. Add power steering fluid to reservoir. Do not fill above specified label. 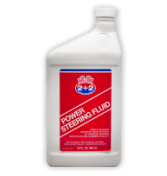 Only pure steering fluids should be used in power steering system. Use of automatic transmission fluids of hydraulic fluids may damage units and void warranties. Check at regular time intervals and check belt adjustment. Consult your mechanic if you have continued fluid loss.